I saw a guide for this awhile back on FW, but I don't have nearly enough patience or skill to do it myself. If anyone has successfully made one of these before (or would like to make another one), and sell it. I'd be happy to buy it for a fair price. The problem is getting a long DB-15 connector that can reach the recessed pins on the Famicom's EXT port. Standard DB-15 plugs aren't long enough and won't reach. Somebody reported success using Neo-Geo controller extension cables, though. Can't you just take the controllers apart and re-wire? They have the same amount of buttons I'd have thought.. I don't want to have to do that every time I want to use a NES controller. I don't want it just to use NES controllers. I want it so I can use the peripherals that go with the NES. the gun in particular? most clones come with a NES gun that uses the EXT port. Not just the gun. It'd be a nice alternative to getting a few of the peripherals twice. Such as the Power Pad, or the Advantage. I've built one last year for my Twinhead PC-100, it works with accessories too just like dork wants. 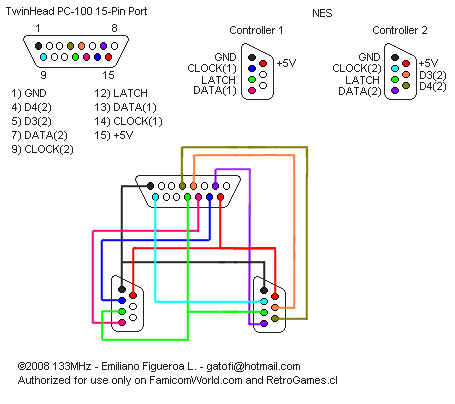 It works electrically with a Famicom but not mechanically (the connector is not long enough to reach the Famicom's pins). Did you try using a Neo Geo extension cable, or was that for something else to make it? I wasn't able to get a Neo Geo extension cable, otherwise I would have used it. My gosh that is the perfect adapter, I wish I had better soldering skills. EDIT- I still really wish I had one of these even today so I can use a Zapper on my AV Famicom without doing the mod. You fancy making any more of those 133MHz?! They don't work on a Famicom with that connector (not long enough), unless I used a Neo-Geo extension cable (which I can't get). I don't have any more spare female NES plugs. I'd have to sacrifice more NES or clones for their plugs to get them. In conclusion, I could make you a cable if you could send me a NeoGeo extension cable, one or two female NES controller plugs, and enough green paper to cover shipping and my troubles. It just barely connects the pins but fortunately works fine. I can supply a set of NES female plugs but I havent the slightest idea where to get a Neo Geo plug... so this project will never work for me. Edit- Have you ever tried taking the standard from its shell, and cut the metal from the sides and then mold it? then just make a solid box with the port to port?